It’s absolutely crazy to think that we’ve been homesteading for almost an entire year. How is that even possible?! 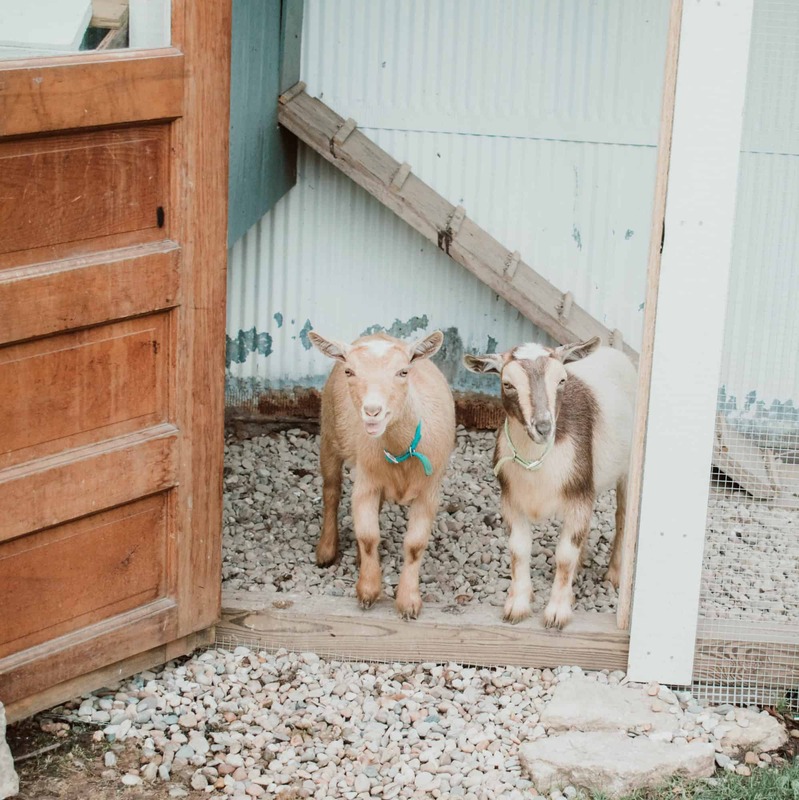 I’m so excited to share my 5 things to know before starting a homestead on the blog today. When Ben and I decided to start a homestead, we had no idea what we were getting ourselves into. This year has been filled with new experiences on the farm. 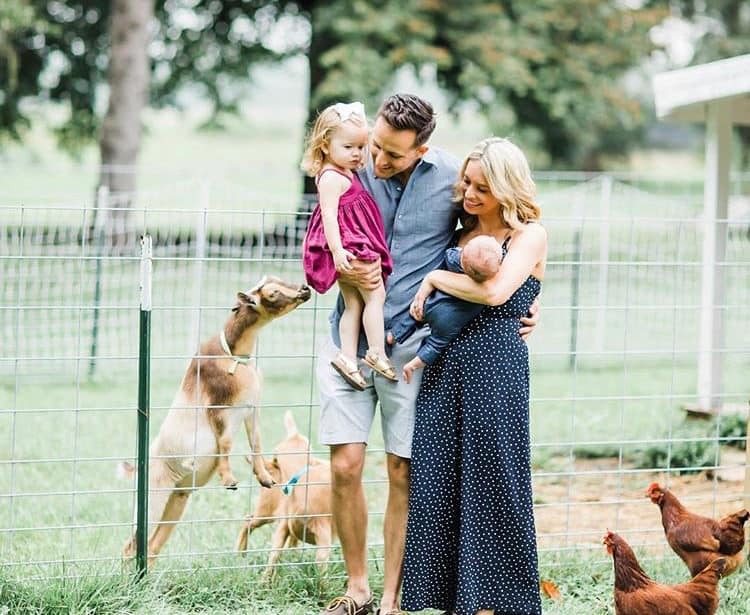 Between learning how to raise baby chicks and goats, building a chicken coop and goat house, and growing our own food – life clearly looks a bit different than it used to over here. 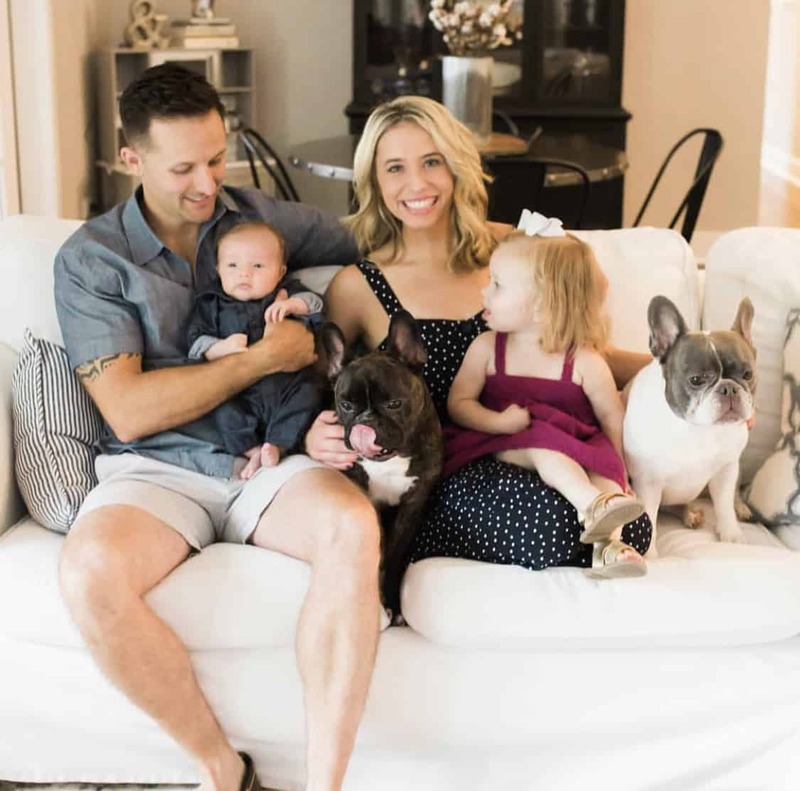 If you’re thinking about starting a homestead, then keep on reading for my 5 things to know before starting a homestead. Once Ben and I decided to start a homestead, we had to figure out a way to make it work financially. 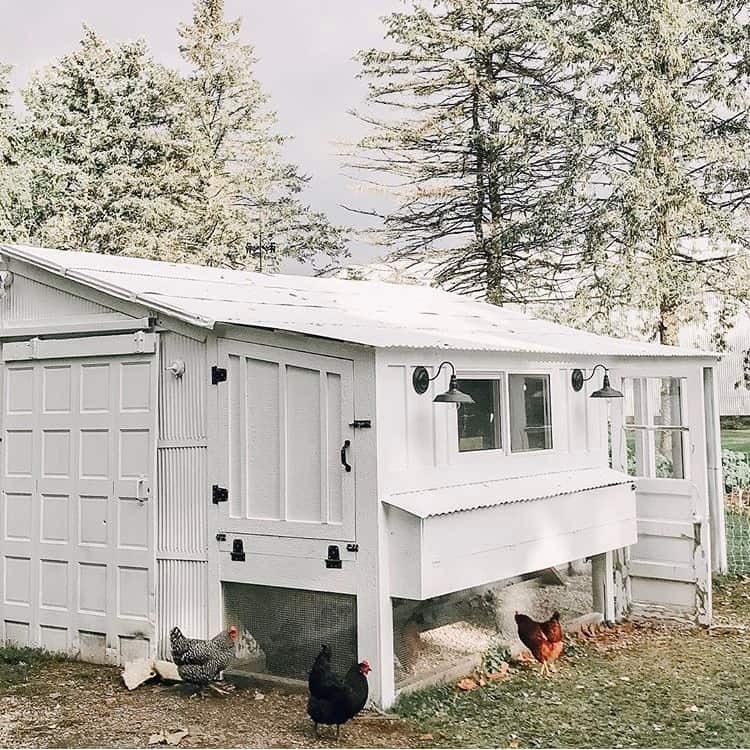 We didn’t have the funds to build a large chicken coop and goat house from scratch, so we decided to use what we already had – an old shed. 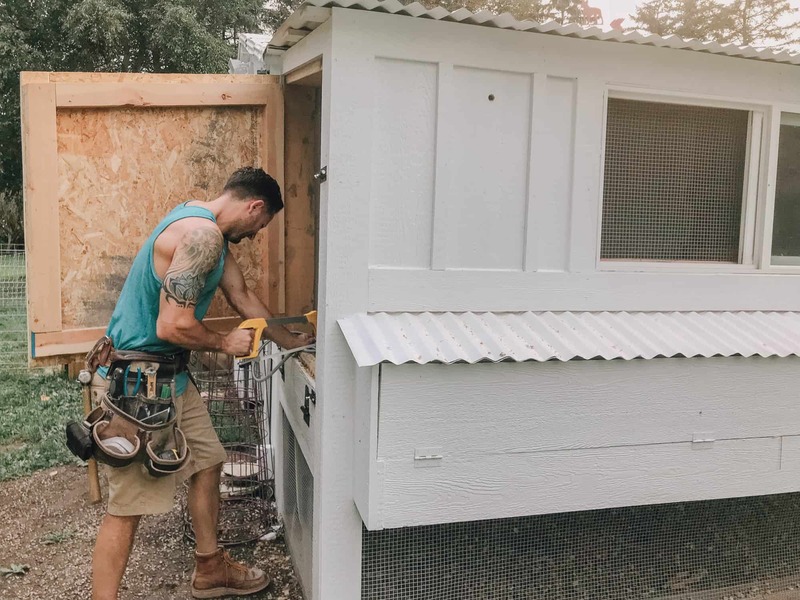 Although converting the shed into our chicken coop and goat house saved a significant amount of money, it was really time consuming. To be perfectly honest, we’re a year into our homesteading journey, and the shed conversion isn’t completely finished. For reference, our shed has three distinct parts. Ben built the goat house and covered deck under one section of the lean-to and the chicken coop/run under the other section of the lean-to. The shed portion is currently being used as storage, but we’re also converting it into a kiddng stall and milking area. We still have a little bit more time until we enter our first kidding season, but we’ll *hopefully* complete the project soon. When considering things to know before starting a homestead, always prioritize function! Ben is the brains behind our animal housing. He’s spent so much time brainstorming ways to make our homestead as functional as possible. We only have a little over an acre of land, so wasting space isn’t an option around here. Creating a combined (yet still separate) goat house and chicken coop allowed us to save space in a functional way. We’ve made an effort to prioritize function in literally every other aspect of our homestead. 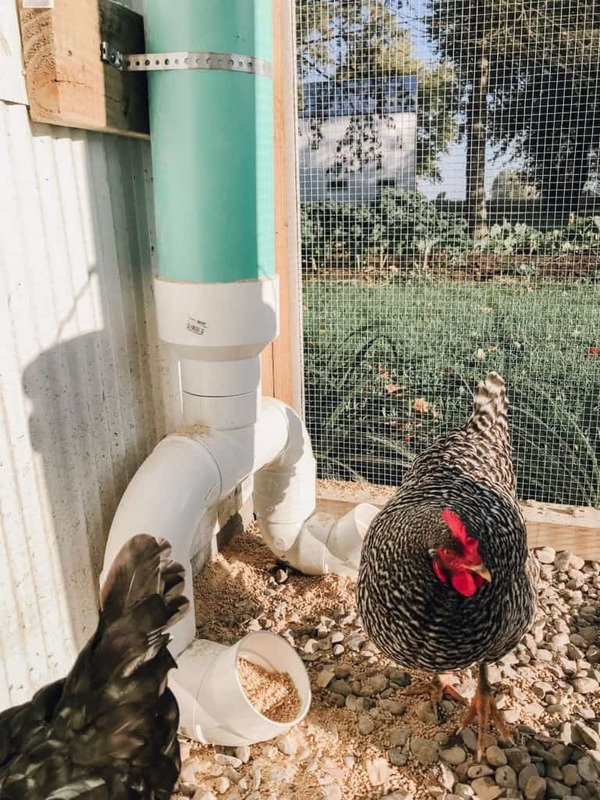 From building (and constantly revising) a hay feeder to reduce wasted hay to building chicken feed/grit feeders that can self-feed our 20 chickens for weeks, we’re always figuring out ways to make our homestead more functional. We’ve made the decision that we would rather spend more time (and a bit more money) making our homestead as functional as possible, which ultimately reduces the time we spend on chores every day and night. Want to know one of the most important things to know about starting a homestead? FENCING! When we first started our homestead, we planned to let our chickens roam around the farm 100% of the time. Well, our plan didn’t exactly work out. Not only did our chickens decide to roam into our neighbors backyard to steal bird food, we also under-estimated the amount of coyotes that we have on the farm. We lived on the farm for about 2 years before starting a homestead. Guess how many coyotes I saw during those two years? ZERO. Since starting our homestead, I’ve seen more coyotes lurking around the cornfields that I can count. During the summer months, I would have to run outside and scare away coyotes on almost a daily basis. It’s a major problem, which leads to me to the importance of fencing. While we love the idea of allowing our chickens to roam around the entire 60+ acres of the family farm, we also fully realize that we’ll likely loose a large percentage of our chickens each year to predators. It’s not a risk that we’re willing to take, so we use a lot of electric fencing to keep our goats and chickens safe. We’ve spent more money that I want to admit on electric fencing, but it’s an investment that’s worth making. Other than an opossum that somehow walked through the fence and snuck into the nesting boxes last weekend, we’ve been incredibly lucky that we haven’t had an issues with predators to date. Speaking of fencing, remember that one time that Penny and Lucy’s gate flew open and they snuck into the chicken coop? 4. Split up farm chores. When we started a homestead, I had dreams of the entire family doing farm chores together every night. We would teach our kids the importance of hard work on the farm while creating memories together. Doesn’t that sound amazing? Well, I didn’t exactly factor in how that lofty goal would work with babies, toddlers, early sunsets, and subzero temperatures. We spend way more time together on the farm during the summer months, but once winter rolls around, it’s not very practical. Maybe I was a bit naive, but I didn’t think that splitting up farm chores was one of the things to know before starting a homestead. Once I let go of my unrealistic expectations for family farm chores, it took us a while to figure out a system that worked for us. Toward the end of my pregnancy and for the first couple months after delivery, Ben did pretty much everything. Once life settled down a bit, Ben and I started splitting up farm chores. I take the morning shift (which is pretty obvious if you watch my Instagram stories) and Ben takes the evening shift. This schedule works for us now, but I have a feeling that it will constantly change as our lives change. And don’t worry… I fully expect to have nightly family farm chores in the summer again! I’m the first to admit that I have a hard time dealing with change. When we decided to start a homestead, I was SO excited. But then the reality set in, and I had a mini freak out. What if I don’t actually like caring for farm animals? Or what if this whole thing was a major mistake? What if it’s fun at first, but then we get sick of the work? I have a feeling that most people have the same concerns before starting a homestead. But here’s the thing – you’ll never regret starting a homestead. So what’s stopping you from doing it, friends? Do you have more than 5 things to know before starting a homestead? What would you add to this list? I would love hear some of your things to know before starting a homestead in the comments below. Great post my friend! We are a year into ours as well and I completely agree with everything you said! Especially the part about doing farm chores together. That one surprised me as well! Love this and that chicken coop is to die for! Great tips. Everything is so true!! I really like the tip of prioritising function, it makes a difference if things work the right way!! By the way love that PVC pipe feeder, so creative.